Thanks for the info. 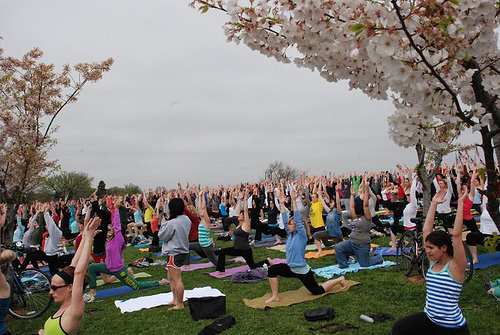 Funny thing is the photo is from Cherry Blossom Yoga, another great Yoga event on the Washington Monument grounds. Ah-ha! That makes total sense! I missed that event. I’ll make sure to catch it and feature it next year! Thank you. It’s a great event, even if it’s a little cold. I’ve never done Yoga on the Mall, but it seems to be a LOT bigger. Will try this year for sure. Thanks again for the heads up. Stay tuned! I’ll definitely highlight more yoga events in our area whenever I run across them! I wish I could have attended the yoga on the mall!! It sounds like such a marvelous experience! It was canceled! I wish they could have re-scheduled it!